I’m definitely excited about really getting into aerial video and see the Phantom UAV (Unmanned Aerial Vehicle a/k/a “drone”) as being my doorway into possibly going commercial with it. Living in Mexico, we do not have the same Federal Aviation Administration regulations and laws concerning commercial use of RC (remote control) aircraft that my counterparts in the United States are facing. Currently, using drones in most commercial applications is still against Federal regulations in the U.S. and the Federal Aviation Administration (FAA) has punted the ball into 2015 before making any real decisions. Many of my private investigator colleagues are absolutely champing at the bit to use drones in their work. Understandably so, but from a practical application most of these multi-rotor copters are very loud, which pretty much rules out covert work altogether. We’re not going to sneak up on anyone with one of these low flying aircraft anywhere we would otherwise be able to film our subjects in public. I do, however, also see a great deal of practicality with the use of drones in private investigation; documenting scenes from altitude for legal analysis, criminal defense or for use in trial, competitive intelligence, site security and protective measures consultations and also for gathering other forms of environmental-based evidence; documentation of illegal logging, code violations, waste and hazardous materials disposal, etc. all immediately come to mind. Last time we hired a helicopter for aerial evidence gathering in my own private investigation agency it cost us in excess of $1,750 an hour! With a drone we would have been able to accomplish the same task for the cost of our own quadcopter or we could have hired a professional drone videographer for about $275 an hour; we probably would have gotten superior footage, too. I’d be lying if I didn’t say that I’m very excited about the prospects of employing drones at CompassPoint Investigations, I just don’t think that they will be used in a way many PIs are considering at this point. Beyond private investigation I can see so many more commercial applications of UAV video and I’m taking this opportunity to get over the learning curve, improve my video equipment and collect some beautiful footage along the way. This is my 4th or 5th flight ever with the DJI Phantom quadcopter but the first video I’ve recorded. I still need a lot of practice to get smooth flight movement and I didn’t take a lot of time to edit the video to the music or work with color correct, brightness or contrast in post. It is what it is – but DEFINITELY watch the video in HD. I’m working on customizing the Zenmuse GoPro camera mount to get the rotors out of the video – that’s a bit frustrating, but the smooth video is well worth the effort. I chose to use The Kleptones’ mashup, “Are You a Visionary?” as the background music because it features snippets of Dr. Martin Luther King’s “I have a dream…” speech. I originally posted this video on the MLK holiday observed in the United States. I’d love to hear your thoughts, suggestions or complaints about my first attempt at aerial video! I would also like to hear your ideas, or what you’ve heard, about drone video and opportunities, too. What commercial applications do you are perfect for the future of these aerial photography platforms? I think the best current use for a small UAV is in security. I would like to see a UAV that could fly preprogramed routes and provide real-time video. This would really help on rural properties. I have used them for arson cases, but there is always the question of perspective distortion by the wide-angle lens. I still have to get on an elevated vantage point and take pics with a SLR camera. I haven’t found a UAV that carries an SLR and delivers quality pics or video that costs less than the rental of a cherry-picker. Scott, what are your thoughts regarding drone use and potential violations of the reasonable expectation of privacy for individuals that are under investigation? There are FAA issues I’ve read about, but apparently, 1) The FAA is not actively going out and looking for violations, and 2) if you are operating the craft within 400 ft, there is no violation, but I would refer to item 1) (who is going to know, unless someone specifically complains?). Bravo to you–I hope you have great success with your UAV ops, and I think you add a lot of value to your customers. If I can ever do anything for you in south Florida, don’t hesitate to call on me. Hi Scott, drones are just starting to get noticed over here in the UK. Hopefully it will be an exciting time for us in the PI field. 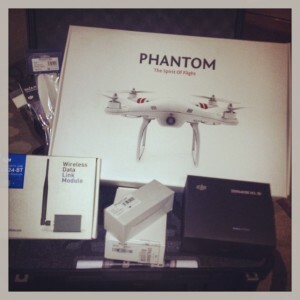 We’re looking at getting a Phantom 2 vision to add to our ‘toolbox’. As regards ‘privacy’ in the UK we have to complete whats called a ‘Privacy Impact Assessment’, as long as that is done and we try to avoid potentially capturing ‘uninvolved individuals’ then there seems to be no Data Protection problems. I’m thinking the beauty of the Phantom is that you can control when it starts recording/taking photos so you can wait until you are over the target area before it starts recording/taking photos? linked from ’20 Ways…’ I live up here in Hood River Oregon and have 25+ years in HVAC in Silicon Valley. I was looking to get into consulting for some of the data centers up here, thermography, drone applications, brewery hvac consulting, etc. Recreational pot, data centers, conservation, bridges, damns, resorts like Mt Hood, electrical towers thruways, windsurfing-(‘video of you wind surfing’, roof inspections, construction. It is all here. Has to be an entrepreneurial niche there somewhere. Keep me on your mailing list. On the fast track as I will have to go back to teaching HVAC/Boilers/Electrical in February. How do I put this on the fast track?